The project’s mission is to provide the basis for the creation of a Linguistic Linked Data cloud that can support content analytic tasks of unstructured multilingual crossmedia content. By achieving this goal, LIDER will impact on the ease and efficiency with which Linguistic Linked Data will be exploited in content analytics processes. We aim at providing an ecosystem for the establishment of a new Linked Open Data (LOD) based ecosystem of free, interlinked and semantically interoperable language resouces (corpora, dictionaries, lexical and syntactic metadata, etc.) and media resources (Image, video, etc. metadata) that will allow for free and open exploitation of such resources in multilingual, cross-media content analytics across the EU and beyond, with specific use cases in industries related to social media, financial services, localization, and other multimedia content providers and consumers. In some cases, we will explore new business models and and hybrid licensing schemes for using of Linguistic Linked Data in commercial settings for Free but not Open resources. LIDER will build upon such existing standards, reference architectures, technologies, and data in order to build the grounds for the use of Linguistic Linked Data for content analytics tasks. Current language resource infrastructures (ELRA, META-SHARE, Monnet, BabelNet) will have a special role and relevance in this project, thus ensuring the adoption of the project outcomes by these infrastructures. 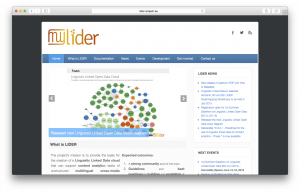 For more information please visit www.lider-project.eu. This project has received funding from the European Union’s Seventh Framework Programme for research, technological development and demonstration under grant agreement no. 610782.